Nusrat took on politi­cal roles while her husban­d was still in power. Described as one of Karachi’s “most beautiful debutantes”, Begum Bhutto, nee Nusrat Ispahani, died in Dubai on Sunday. Nusrat was born on March 23, 1929 to parents of Kurdish-Iranian heritage and was pampered by her elder sisters. She completed her senior Cambridge exams at the Convent of Jesus and Mary in Bombay, but did not go to college. Nusrat’s family migrated to Karachi in 1947. Nusrat joined the Pakistan Women’s National Guard, knew martial drill and learned to drive trucks and ambulances. She met Zulfikar Ali Bhutto in 1949, when he returned to Karachi from Berkeley to attend his sister’s wedding. They were introduced by his mother when they ran into each other at a bank, and then later at the wedding, where Zulfikar kept dancing with Nusrat. Zulfikar proposed to Nusrat but she “took it as a joke” because she knew he was returning to college. Bhutto’s parents objected to the match because Nusrat was not Sindhi and her father was a businessman. According to Fatima Bhutto’s book Songs of Blood and Sword, the headstrong Zulfikar decided to elope with Nusrat, enlisting the help of a friend who raced around Karachi trying to find a Shia cleric to conduct the nikah. Sir Shahnawaz Bhutto later hosted a reception for the couple. Nusrat spent some time in London with Zulfikar and returned to Karachi for the birth of their first child, Benazir. The couple had three more children – Murtaza, Sanam and Shahnawaz. 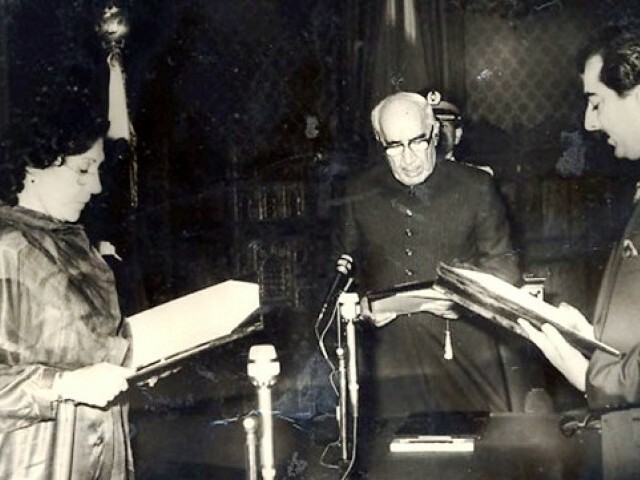 Nusrat took on political roles while her husband was still in power, including a position in the cabinet. But when Bhutto’s government was deposed and he was imprisoned by General Ziaul Haq’s regime, Nusrat was faced with a choice – go abroad or live in Pakistan but stay out of politics. Nusrat chose to continue her husband’s legacy and struggle for his release. “Many important political figures had left the party, so Begum Bhutto renewed the party,” longtime PPP activist Taj Haider said. The 1970s and 1980s were marked with numerous house arrests and detentions for Benazir and Nusrat and the Zia regime did not allow her to attend her husband’s funeral after he was executed in 1979. Nusrat’s health began to deteriorate and in 1982, she was finally allowed to leave the country for medical treatment after doctors suspected she had cancer. Kamal Azfar, who worked closely with Zulfikar and Benazir Bhutto, recalled Nusrat as a wonderful person and hostess and recalls how caring she was as a mother. “Her son was the apple of her eye,” Azfar says. Nusrat and Benazir’s relationship took a turn in 1993, when Murtaza announced he would return to Pakistan. Nusrat was split between her two children and in 1994, she blamed Benazir for the firing and teargas shelling by security forces as Nusrat led a procession in Larkana. Nusrat, who had outlived the deaths of her husband and one of her sons, never recovered after Murtaza’s assassination in Karachi in 1996. Body of former prime minister’s wife will arrive from Dubai today. "Her picture after being clubbed in Gaddafi Stadium Lahore remains a strong symbol of struggle for democracy." All the educational institutions, offices of provincial and local governments will remain closed. Brave lady. All the Bhuttos have had brave women. Sad that after Murtazas murder she was not the same. Begum Nusrat Bhutto has offered more sacrifices than any woman in the history of the country. She had seen the cruel era of Dictator Zia and her sufferings continued till the murder of BB in Dictator Mush’s era. Her struggle for democracy and against the Zia has been a bright chapter in the history of the country. We love you Begum Sahiba and may God bless you. It is a shame that the last 32 years of her life were a living hell that no parent has to go through. What a great lady, she lost her husband, two sons and her daughter all for this country called Pakistan.